You’ve got to love a gluten and egg free recipe that works just as well as if it weren’t, tastes just as good as its gluten-full counterparts and doesn’t cost the earth to make. That’s exactly my review of my friend Mim’s Gluten Free Raspberry Slice. This very simple recipe looks far more impressive than the minimal effort it actually requires – so don’t be put off by the creaming of the butter and sugar – everything else is so jolly simple, it’s really not a deal-breaker. Serve this up to all your guests as a dessert with cream or icecream or simply as a an eye-pleasing morning or afternoon tea. Finally, this yummy number can be done with berries of your choice (mine pictured above is mixed berry) and regular flour should you not require freedom from gluten. Either way, will only set you back around $4. Thankyou Mim, I can tell I’m going to be making this again and again. Line lamington pan with baking paper. Beat butter, vanilla and sugar until light and fluffy. Stir in almond meal and sifted flour. Press 2/3 pastry into base – reserve rest for crumbling on top. Bake uncovered in moderately hot oven (200) for 10 minutes until lightly browned. Sprinkle raspberries over the top. 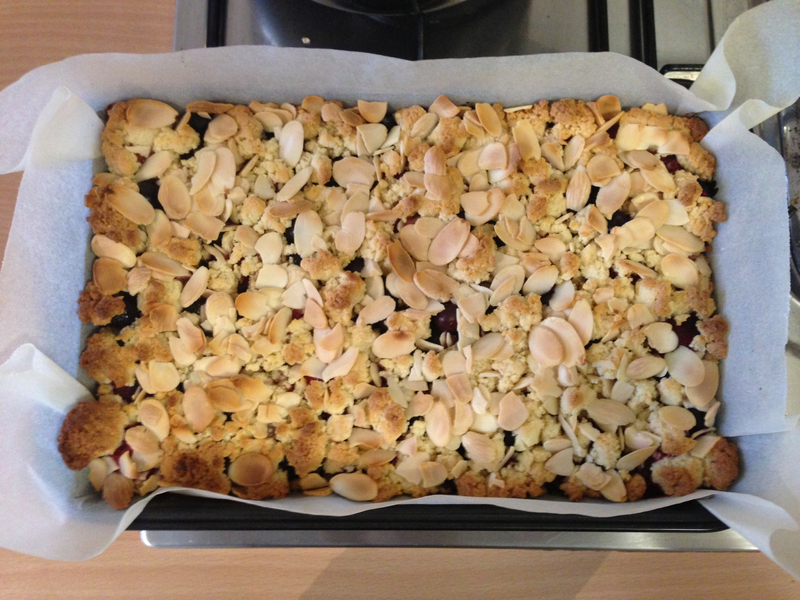 Sprinkle remaining pastry (crumbled) and flaked almonds. Bake 35 minutes, or until brown. Cool in pan. Lift whole slice out using baking paper. Cut into squares, dusting pieces with icing sugar. My dear friend Kim contributed this terrific little recipe from taste.com AGES ago – but I only recently noticed it in the foodthatserves@gmail.com inbox. This is a bonza recipe: the ingredients are ones you’re likely to find in your pantry and freezer and there’s no butter in it at all. If you’re avoiding sugar this recipe works well by simply exchanging sugar for dextrose exactly. If you don’t have raspberries in your freezer but do have tinned ones or berries of another kind, do feel free to exchange as needed. 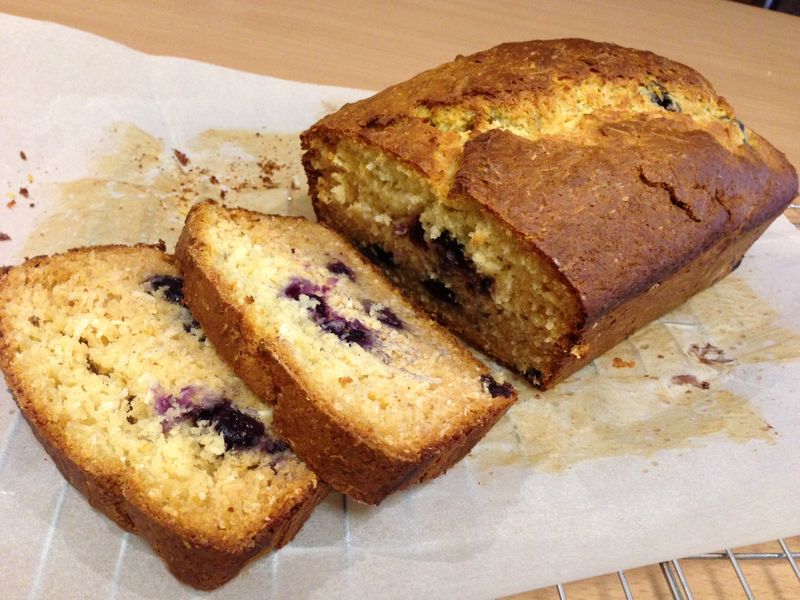 I made this using blueberries (see second photo) and it tasted lovely. This gorgeous little loaf will cost you no more than $4 to make. Enjoy! Combine coconut and coconut milk in a large bowl. Cover and stand for 30 minutes (or not – I have little patience for steps like these!). Preheat oven to 170°C. Line base and sides of a 7cm-deep, 10.5cm x 20.5cm (base) loaf pan with baking paper, allowing a 2cm overhang at both long ends. 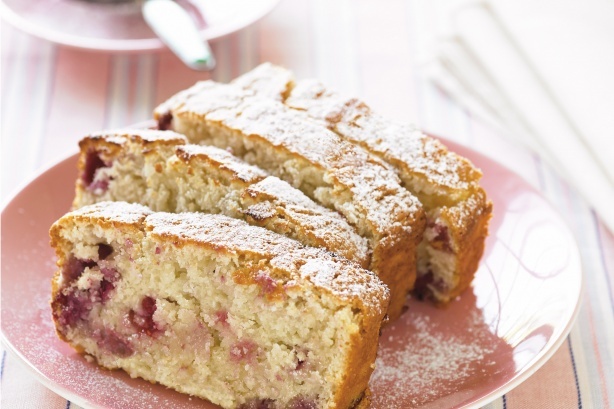 Toss frozen berries in extra flour (this will prevent them from sinking to the bottom of the loaf as it cooks). Using a metal spoon, stir sugar, egg and vanilla into coconut mixture. Sift flour over coconut mixture. Gently stir until combined. Fold in raspberries. Spoon mixture into prepared pan. Bake for 1 hour 10 minutes to 1 hour 15 minutes or until a skewer inserted into the centre comes out clean. Cool loaf in pan for 10 minutes. Lift onto a wire rack to cool completely. Dust with icing sugar and slice. Serve toasted, if desired. While it is true that winter is my favourite season of the year, I can’t help but feel a little enlivened by the warmer weather and the knowledge that summer is on its way. The shops are starting to supply summery fruits once more: mangoes, melons, apricots and other stonefruits, my favourite being the yellow peach. To celebrate the promise of all things summer, I decided it’s the perfect time to try out this simple and delightful recipe from my friend Jess. I love the way Jess does hospitality – simple and tasty food accompanied by no amount of fuss and flourish, she simply focusses on the folks she’s serving. 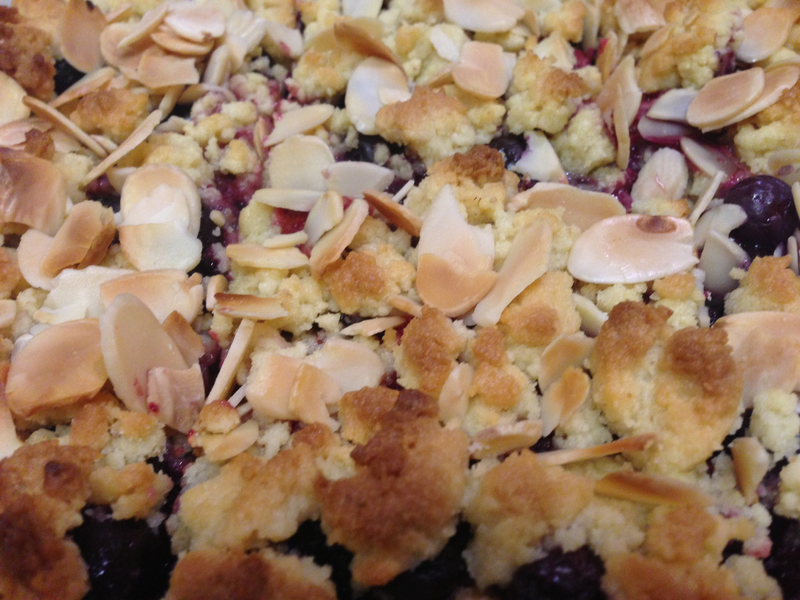 This lovely dessert is the first of a number of affordable and tasty recipes contributed by Jess – costing no more than $5 and even less when peach season is in full swing. 1. Preheat oven to 160 degrees and line 22cm springform tin (not a tart tin – the first time I made this I used a loose-bottomed tart tin and it overflowed because the walls of the tin didn’t come up high enough). 2. Beat butter, sugar, vanilla until light and creamy. Add the eggs and beat well. 3. Fold in flour and put in tin. 5. 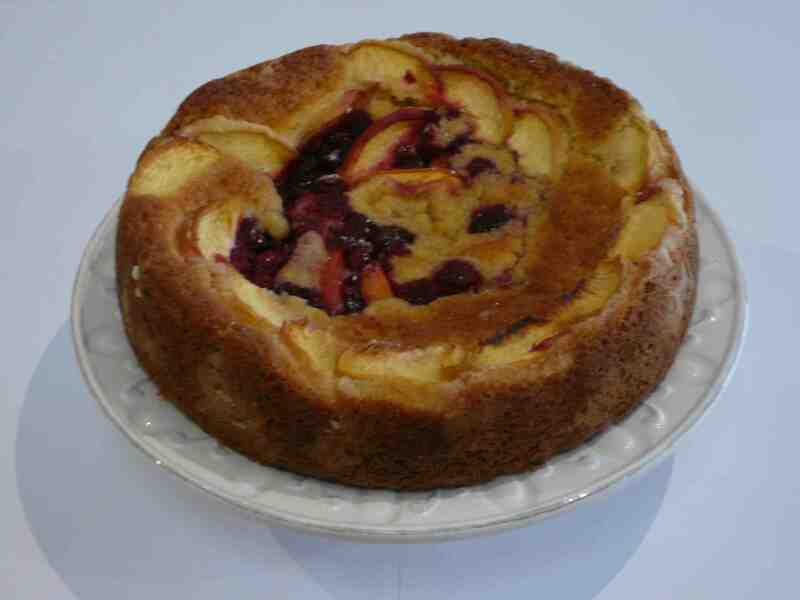 Bake 1 hour or until cooked through and serve with vanilla ice-cream, thick cream or good quality yoghurt.